It has been quite an exciting year for the B&H Photography Podcast, as well as for podcasting as a medium in general. Hugely popular shows such as S-Town, The Daily, and Radiolab have taken podcasts to new heights in terms of amazing content, and have also substantially raised the bar for audio production. While many of these top-notch programs are produced in broadcast studios by seasoned professionals, you don’t need to be a hot-shot engineer to make great-sounding podcasts. With an understanding of some basic recording and mixing techniques, plus the right gear and software, it is possible to achieve pro-sounding results in the comfort of your own bedroom or garage. In the paragraphs below, we’re going to explore some essential gear for making great-sounding podcasts. One of the most important components for making great recordings is the acoustic environment. For podcasts, you’ll generally want to go for a tight and direct vocal sound, free of echo and room ambience like air conditioners and ceiling fans. Finding a quiet, non-reverberant space in your home can be tricky, but there are some key points to look for, and some easy, inexpensive things you can do to improve the acoustics of your podcast studio. First rule of thumb: Hard, reflective surfaces that cause echoes are not your friend. As tempting and potentially relaxing as it may be, do not record your podcast in the bathtub. Pick a carpeted, spacious room with soft furniture, and try to set up in the center of the room, away from the walls and windows. While these suggestions will make a difference, if you’re serious about preventing those nasty early reflections that give your vocal recordings that reverberant, unpolished sound, an investment in some basic acoustic treatment will take your studio’s acoustics to new dimensions, and help you achieve more professional results. If you’re a one or two-person show with limited space to work, or if you need your studio to be portable, the Auralex DeskMAX Stand-Mounted Acoustic Panels offers a great solution that’s extremely easy to set up. The DeskMAX package consists of two 2 x 2' panels with built-in mounting stands, and includes a convenient travel bag to take your show on the road. As its name suggests, the DeskMAX can stand up on your desk or table to help absorb reflections from nearby walls and hard furniture. 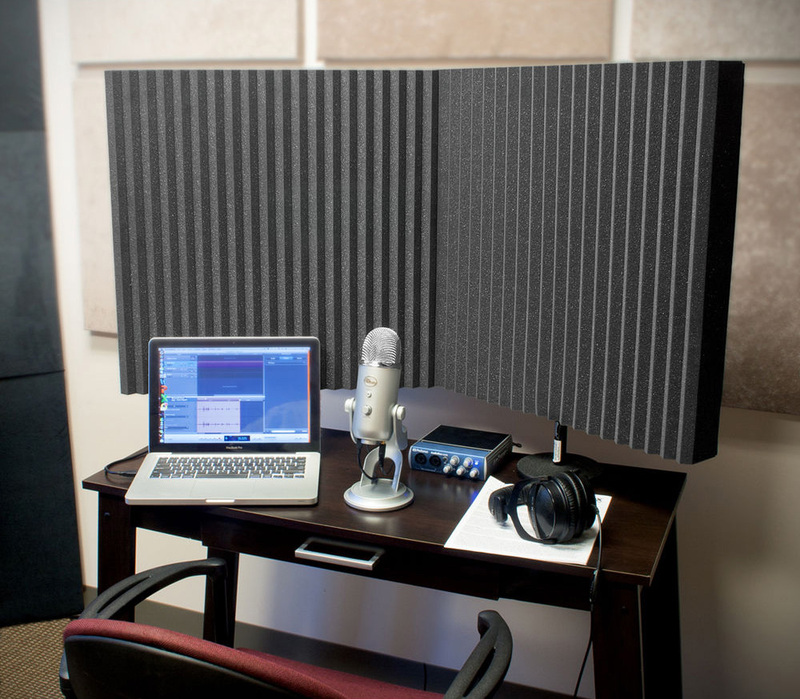 Other options for this style of treatment include the Aston Microphones Halo Reflection Filter, which features a patented PET-felt acoustic technology and molding technique to reflect, absorb, and diffuse sound in professional and home-studio environments. I would be remiss if I didn’t include the ISOVOX 2 Portable Vocal Isolation Booth, which is designed to offer up to 35 dB of sound reduction. It’s designed for a single person, but offers stellar results nonetheless. Check out this video to see and hear it in action. If you want to record three or four people at a time, the 36-piece Auralex D36 Roominators Kit provides you with more comprehensive coverage, with enough paneling to treat all four walls and ceiling in a 6 x 8 x 8' room. If you’ve experimented with recording your voice using your laptop’s built-in mic, you’ve probably come to the realization that it’s not going to yield broadcast-quality results. Upgrading your microphone will make a profound difference in the quality of your vocal recordings, and there are plenty of great options to choose from. If your show only requires one microphone, USB mics can offer a simple, convenient, and cost-effective solution. This is because they allow the audio signal to be fed directly into software-based recording applications, without the need of any additional hardware. 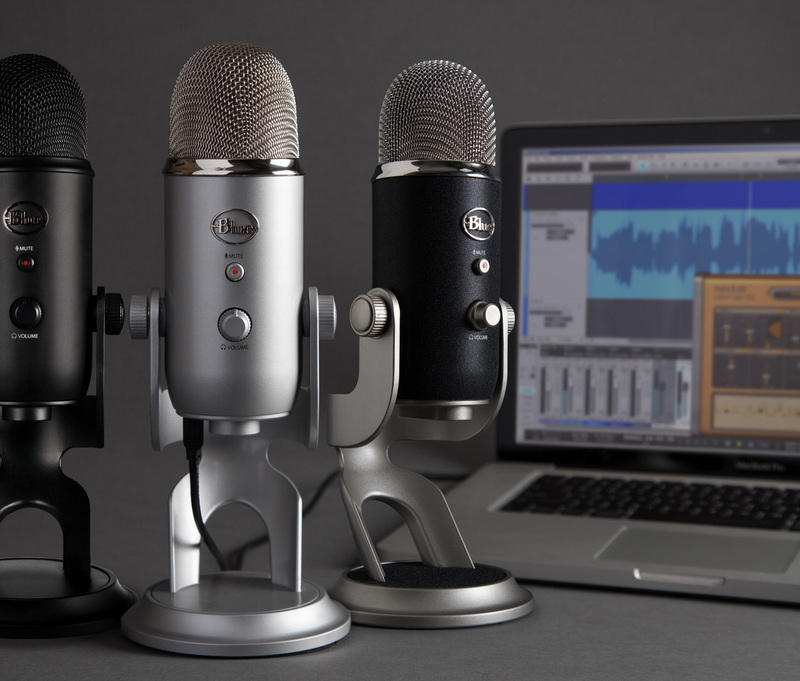 Perhaps the most popular USB mic of all time, the Blue Yeti USB Microphone delivers tried-and-true performance at a price that won’t have you skipping dinners. The Yeti records at 16-bit, 48 kHz high-quality resolution, and incorporates tri-capsule array with three condenser elements to give you a choice between cardioid, bi-directional, omnidirectional, and stereo. The cardioid polar pattern has a more focused pickup and generally "hears" whatever the mic is pointed at, while the omnidirectional pattern picks up sounds in all directions. 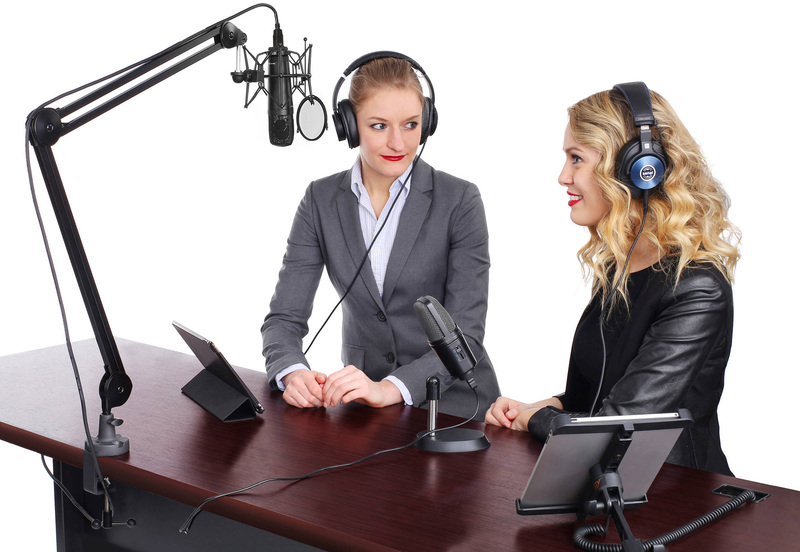 The bi-directional is a figure-8 pattern, which is great for recording an interviewer and guests, while facing each other. However, for podcasts with just one person speaking into the mic at a time, you will generally want to stick to using the cardioid pattern, which will yield the tightest vocal sound, and pick up the least room ambience. If you have a little more dough to spend and are looking for a higher-end, more professional solution, mics like the Lewitt DGT 650 and the Apogee Electronics MiC Plus offer higher-quality 24-bit/96kHz recording, as well as dedicated 1/8" headphone outputs for monitoring. 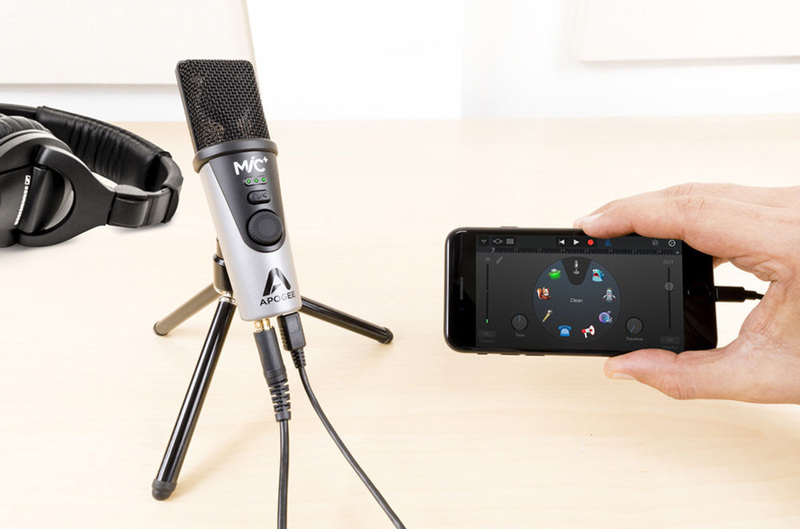 Other microphones to check out include the Neat Beecaster, as well as Blue Yeti Pro USB Microphone, which offers HD quality in a USB microphone with 24-bit / 192 kHz resolution. My personal favorite USB mic for getting that big, deep broadcast vocal sound is the RØDE Podcaster. The Podcaster features a dynamic transducer, rather than a condenser element like the other mics I mentioned. While this makes the mic a bit less sensitive than the others, it also gives it the advantage of being less prone to picking up unwanted mouth sounds such as lip smacks and other noises. The Podcaster also features headphone monitoring and 48 kHz resolution but, unlike the other USB mics, it doesn’t have an integrated stand, so you’ll have to pick up a broadcast arm like the Auray Two-Section Broadcast Arm with Integrated USB Cable to go along with it. If your show has more than one host, or if you plan to have guests, you’ll need two or more microphones. Although it’s possible to use more than one USB mic at a time under certain circumstances, it can be a hassle to set up, and some audio software won’t allow it at all. So, if your podcast calls for multiple mics, my recommendation is to go with a more traditional setup, consisting of separate microphone and audio interface components. A great mixer/audio interface that will allow you to record 1-4 speakers at a time is the PreSonus StudioLive AR8 USB 8-Channel Hybrid Performance and Recording Mixer. The AR8 records each channel to a separate track, which is ideal for mixing and editing your show in post production using the included audio recording software. Additionally, the mixer is equipped with extra inputs for hooking up an MP3 player to mix in music or sound effects, or a Telephone Audio Interface like the JK Audio AutoHybrid for taking land-line callers. A few great dynamic broadcast mics with XLR outputs to pair with the AR8 are the RØDE Procaster, the Shure SM7B, and the Electro-Voice RE20. None of these mics comes with a stand or a cable, but you can kill two birds with one stone by picking up the Auray BAE-2X Two-Section Broadcast Arm with External Springs & Integrated XLR Cable. 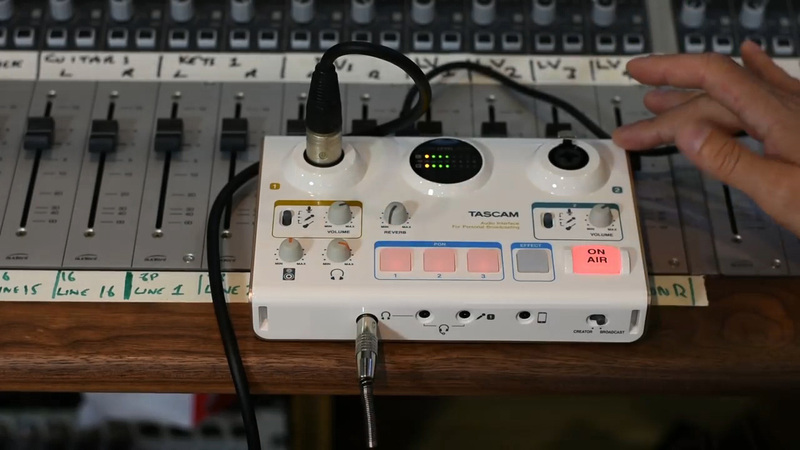 Additionally, Tascam released the miniSTUDIO Series US-32 and US-42, which are purpose-built for broadcasting. The US-32 has a built-in omnidirectional condenser microphone and one mic preamp for an external mic, while the US-42 has mic preamps for two external microphones. Each interface features on-board DSP including EQ, compression, reverb, and special FX, and three self-lighting, velocity-sensitive trigger pads for adding sound effects quickly and easily. The interfaces are available separately or as part of a kit for single person podcasts, two-person podcasts, and video bloggers. The art of recording and mixing audio is an extremely broad topic, one whose full breadth is far beyond the scope of this article. However, there are some easy-to-learn, fundamental techniques that you can use that will help you achieve great results, without years upon years of experience. No matter what audio software you’re using, be it something basic like Garageband, a free program like Audacity, or higher-end software like Pro Tools or Cubase, you can bet that its stock feature set includes your two most valuable tools as a podcast mix engineer: an equalizer and a compressor. Start by adding a high-pass filter on all your voice tracks at 100 Hz. This cut alone will improve your mix substantially. Next, add a compressor after each EQ. Now with compression, less is more when it comes to mixing broadcast, as the goal is simply to smooth out the dynamics of each speaker to maximize vocal intelligibility, and to give the production a more polished sound. Start with moderate attack and release, 3:1 compression ratio, and conservative threshold settings. There are tons of resources you can turn to for more in-depth mixing instruction, from books, to DVDs, to online forums. 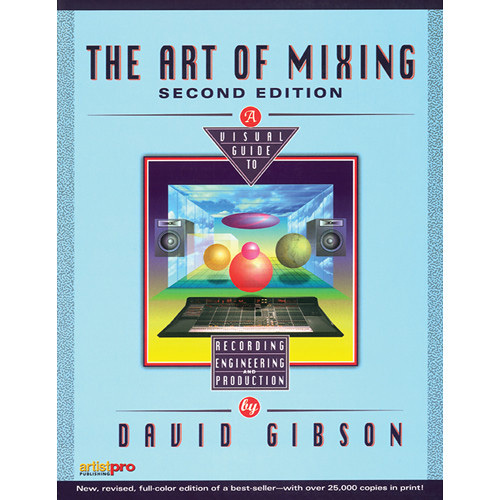 Many of the books out there, like The Art of Mixing, by David Gibson, focus mainly on music, but many of the concepts and techniques offered also apply to mixing dialog. After you get your feet wet using your DAW’s built-in tools, you may get the itch to try some more advanced plug-ins to take your mix game to new strata. 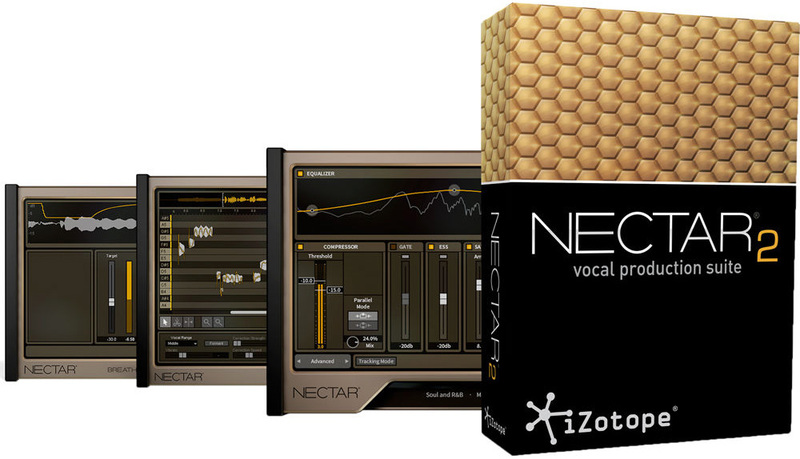 iZotope Nectar 2 Production Suite offers a powerful selection of processors, specifically tailored to fine-tuning vocals. Use high-quality EQ, compression to sculpt and polish pro-sounding vocals, and de-essing to tame overly sibilant “ess” sounds that can be tiring for the listener. If you really want to get down to the nitty-gritty, iZotope RX 6 comes in a variety of editions to suit your budget and can really help to improve upon the shortcomings of your acoustic space, and eliminate much of the unwanted ambient room sound in your recordings. It’s relatively easy to use, and will help you get closer to that quiet, broadcast-studio sound. At some point, like all new audio engineers and producers, you’re inevitably going to look at yourself in the mirror and say, “Why are my podcasts so much quieter than the professional ones? !” The likely answer –your audio is un-mastered. 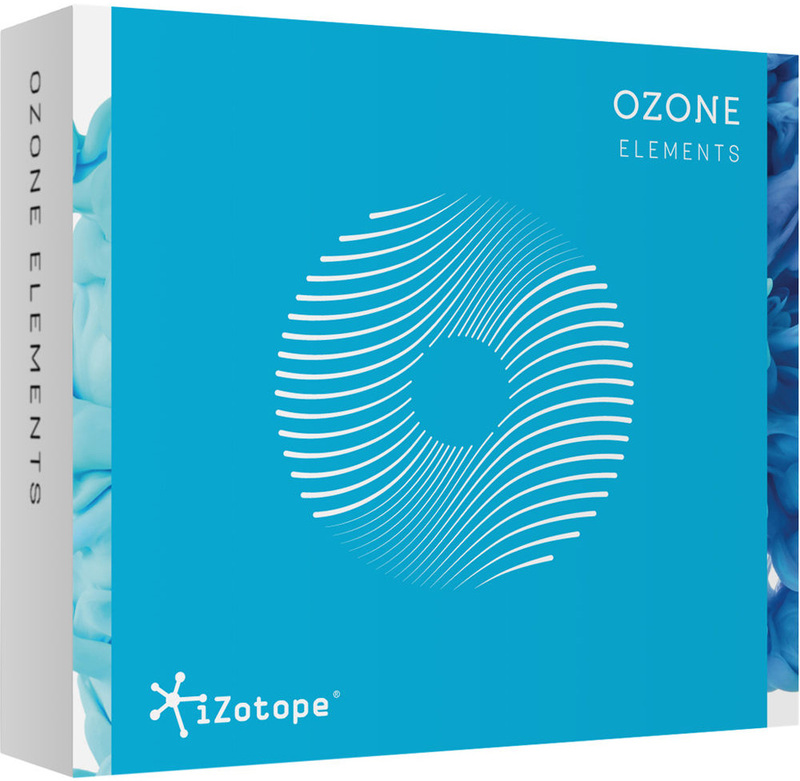 iZotope Ozone 8 is an extremely versatile mastering package that gives you plenty of room to grow as a mastering engineer. It has a broad palette of pro-level mastering tools, but also a huge variety of presets that anyone can use for making bigger, louder-sounding recordings. If you’re thinking of starting a podcast from scratch, or you’re looking to take your existing show to new heights, hopefully this article can serve as good starting point for building your studio. I encourage you to leave any questions or thoughts you may have in the Comments section below, and thanks for reading. Axient Digital: A Shure Bet for Worry-Free Wireless Systems!